The vaccine, which encourages patients’ immune system to help fight the tumour, has been developed by experts from the MU Faculty of Medicine. The clinical study is designed for 20 patients. So far, seven children from the Czech Republic and other countries have been included in the study. Experts from the Faculty of Medicine at Masaryk University have developed a new vaccine that helps improve the success rate of solid tumour treatment in children. The medicine, which is produced at the Department of Pharmacology, has already been administered to two patients in a clinical study. The first results of the study, whose purpose is to verify the safety and effectiveness of the product, will be available in approximately 18 months. The vaccine is used as a part of immunotherapy and is combined with standard treatment for childhood cancer. “It represents a huge improvement in treatment, which could help patients that are less likely to respond well to standard treatment. That is because the vaccine encourages patients’ own immune system to help fight the tumour,” says Jaroslav Štěrba, head of the department of paediatric oncology and vice-dean of the Faculty of Medicine. The medicine is prepared in “clean rooms” certified by the State Institute for Drug Control for cell therapy. “Physicians first remove part of the child’s tumour and also some of his or her white blood cells. Afterwards, we cultivate both samples so that the resulting vaccine activates the immune response of the organism against the tumour,” says Regina Demlová, head of the Department of Pharmacology, about the procedure. The clinical study is designed for 20 patients. So far, seven children from the Czech Republic and other countries have been included in the study. “Patients suitable for the clinical study are selected very carefully, in order to verify the safety and also the effectiveness of the vaccine. We mostly include children who have been repeatedly diagnosed with a tumour and standard treatment has not been effective,” emphasises Štěrba. 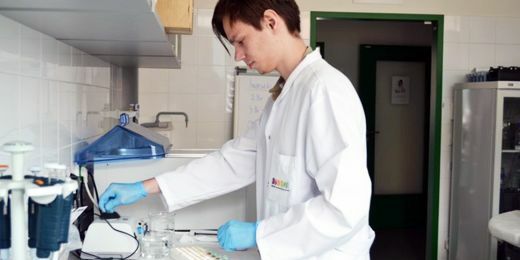 For each of the children who are selected, experts prepare a separate vaccine in the laboratories of the Faculty of Medicine at the Bohunice campus. Thanks in part to previous research, the experts have been able to develop the new vaccine in three years. Research and development was financed by the Ministry of Education from state budget expenditures for research, experimental development and innovation. The overall costs amounted to 20 million crowns, including reconstruction of the clean rooms financed by MU. University Hospital Brno and Masaryk Memorial Cancer Institute also participate in the research. Although great progress has been made in treating tumours in children, it has slowed in the past decade, as children are outside the focus of attention of pharmaceutical companies. “Immunotherapy is currently the ‘big thing’ in adult oncology and it improves survival rates for a number of tumours in adults. However, trials of new medicines in children only follow with a significant delay,” notes Štěrba, adding that the current situation was also discussed in the European Parliament as part of Childhood Cancer Awareness Day. 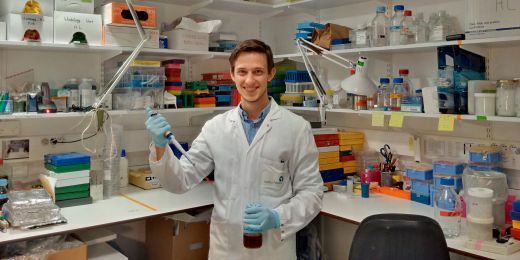 The 22-year-old Ondrej Beláň is among the elite medical students participating in the P-PooL programme. What do 7 days look like in the life of Klára, a dental student? Find more in the “A Student’s Week” series.